[Video] Is Live Chat Working great for your MSP Business? Blog DeskDirector Business Blog [Video] Is Live Chat Working great for your MSP Business? 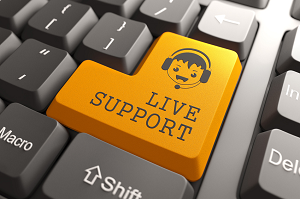 Is your MSP business getting the most out of your live chat support? In this video episode, you will learn how you can achieve better results when implementing live chat. What thinking and decisions as a managed service provider you should make before introducing chat to your customers? Check it out! “Hi, I'm Warwick from DeskDirector. Today, I'd like to talk about chat. The thing about chat is that live chat in isolation is not a great idea. You shouldn't treat it as, like, a feature release or a product for your customers. You should think of it as an option that fits seamlessly into your solution and service to your customers. Live chat is all about timely response and solving problems and a decision tree for fixing stuff. The question at any time in any ticket should be, "What's the anticipated and personal and relevant response that my customer expects on this ticket?". Is that a live chat, or is it near live? Is anyone going to leave a message that they're going to know about and they can clear in a few hours? Should it be a bot, automated response? It could be an old school old-fashioned phone call or site visit. It might be an escalation. So, it is important to think at this point what do I need to do in a particular service ticket and where the live communications that involve chat, which is pretty much leaving a message and knowing that it's there, when is it appropriate? So, to think about that, you should know, obviously, and understand what your customer wants and what's important to them, and make sure they're in control. Now, if you've got managed services, it's probably a good idea to discuss that in those meetings. How do you want to communicate? When do you want to escalate? When is it important to be real-time and when is it important just to leave a message or leave a note in the ticket? We want to make it personalized. Honestly, the great thing about chat or live communications is it's effortless and stress-free, personal, and you can also get closer the people's emotions. You can see whether they're annoyed when it's live. So, that's the important thing about chat. So, in the past, we have deployed chat from DeskDirector as a big feature, and that's led to some poor deployments. I think some customers did a great work with chat, but we're making some new developments in chat that I think are going to be very exciting and fit closer to the ideas that I've just said in this video. My next video will go on to what we're going with chat and what we're calling internally: "DD Talk."